Two H-53 Pavelow helicopters along with four Apache Gunships which made up �Task Force Normandy� are seen moving into position to strike Iraqi early warning radar sights. 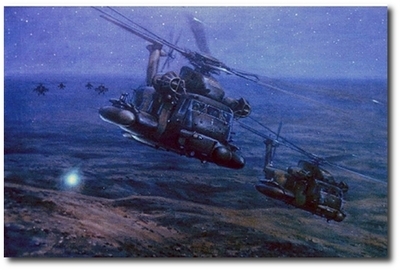 The H-53�s are seen dropping a bundle of �chemlights� to mark the final update point for the Apaches� fire control computers. 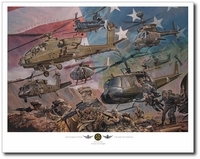 Minutes later, at 0238 on 17 January 1991, the first volley of Hellfire missions slammed into Iraqi bunkers kicking of the air war in Desert Storm.